St Blaise: Many Catholics might remember Saint Blaise’s feast day because of the Blessing of the Throats that took place on this day. Two candles are blessed, held slightly open, and pressed against the throat as the blessing is said. Saint Blaise’s protection of those with throat troubles apparently comes from a legend that a boy was brought to him who had a fishbone stuck in his throat. The boy was about to die when Saint Blaise healed him. Blaise is the patron saint of wild animals because of his care for them and of those with throat maladies. Before being martyred, he is said to have healed a boy who was choking. Since the eighth century, Saint Blaise has been venerated as the patron of those who suffer from diseases of the throat. We pray in a special way today for protection from afflictions of the throat and from other illnesses. The blessing of Saint Blaise is a sign of our faith in God’s protection and love for us and for the sick. In the name of the Father, and of the Son, + and of the Holy Spirit. St Laurence: He was one of those who accompanied St. Austin into this island, about the year 597, and was his immediate successor in the see of Canterbury, in 608, in which he sat eleven years. When Eadbald, son and successor to the holy king Ethelbert, not only refused to follow his father’s example in embracing the faith, but gave into idolatry, and incestuously took to his bed his father’s widow, Laurence having labored hard for his conversion to no purpose, and despairing of reclaiming him, thought of nothing but retiring to France, as some others had already done. But he was severely scourged by St. Peter, in a dream, on the eve of his intended departure, with reproaches for designing to forsake that flock for which Christ had laid down his life. This did not only prevent his going, but had such an effect upon the king, when he was shown the marks of the stripes he had received on this occasion, that he became a thorough convert, doing whatever was required of him, both for his own sanctification, and the propagation of Christianity in his dominions. St. Laurence did not long survive this happy change, dying in the year 619. He is mentioned in the Roman Martyrology. Priests of the Lord, bless the Lord; holy men of humble heart, praise God. Dan. 3:57 Bless the Lord, all you works of the Lord, praise and exalt Him above all forever. V. Glory be to the Father, and to the Son, and to the Holy Ghost. R. As it was in the beginning, is now, and ever shall be, world without end. Amen. Priests of the Lord, bless the Lord; holy men of humble heart, praise God. O God, Who gladden us with the yearly festival of blessed Blaise, Your Martyr and Bishop, mercifully grant that, as we venerate the anniversary of his martyrdom, we may also rejoice in his protection. Through Jesus Christ, thy Son our Lord, Who liveth and reigneth with thee, in the unity of the Holy Ghost, ever one God, world without end. R. Amen. 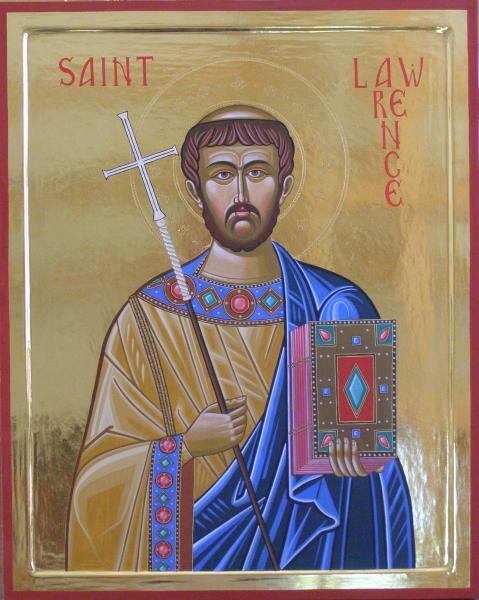 Grant, we beseech Thee, O almighty God, that the august solemnity of Thy blessed confessor and pontiff, Laurence, may increase our devotion and promote our salvation. Through the same Lord Jesus Christ, Thy Son, Who liveth and reigneth with Thee in the unity of the Holy Ghost, one God Forever and ever. R.Amen. Lesson from the Epistle of blessed Paul the Apostle to the Corinthians. Brethren: Blessed be the God and Father of our Lord Jesus Christ, the Father of mercies and the God of all comfort, Who comforteth us in all our tribulation; that we also may jbe able to comfort them who are in all distress, by the exhortation wherewith we also are in all distress, by the exhortation wherewith we also are exhorted by God. For as the sufferings of Christ abound in us: so also by Christ doth our comfort abound. Now whether we be in tribulation, it is for your exhortation and salvation: or whether we be comforted, it is for your consolation: or whether we be exhorted, it is for your exhortation and salvation, which worketh the enduring of the same sufferings which we also suffer. That our hope for you may be steadfast: knowing that as you are partakers of the sufferings, so shall you be also of the consolation, in Christ Jesus our Lord. You crowned him with glory and honor. V. You have given him rule over the works of Your hands, O Lord. Ps 111:1-3 Happy the man who fears the Lord, who greatly delights in His commands. V. His posterity shall be mighty upon the earth; the upright generation shall be blessed. V. Wealth and riches shall be in his house; his generosity shall endure forever. Sanctify the offerings dedicated to You, O Lord, and through the intercession of blessed Blaise, Your Martyr and Bishop, look upon us with mercy because of them. Through Jesus Christ, thy Son our Lord, Who liveth and reigneth with thee, in the unity of the Holy Ghost, ever one God, world without end. R. Amen. By the offered gifts we beseech thee, O Lord, that thou kindly enlighten thy Church, so that thy flock may everywhere progress and prosper, and thy shepherds, under thy guidance may be pleasing to thy name. Through Jesus Christ, thy Son our Lord, Who liveth and reigneth with thee, in the unity of the Holy Ghost, ever one God, world without end. R. Amen. May this Communion, O Lord, cleanse us of sin, and through the intercession of blessed Blaise, Your Martyr and Bishop, may it make us sharers of heavenly healing. Through Jesus Christ, thy Son our Lord, Who liveth and reigneth with thee, in the unity of the Holy Ghost, ever one God, world without end. R. Amen. Being appeased, O Lord, guide thy Church, which has been nourished by holy refreshment, that under thy direction and powerful rule it may receive increase of liberty and may continue in religious integrity. Through Jesus Christ, thy Son our Lord, Who liveth and reigneth with thee, in the unity of the Holy Ghost, ever one God, world without end. R. Amen.